SILVER Survivors! Please check your Inbox! If you have not yet received the eMail with your SURVIVOR NUMBER for early booking, please check your spam folder and if you cannot find it then contact us… you can use your SURVIVOR NUMBER for early booking until Public Sales start. 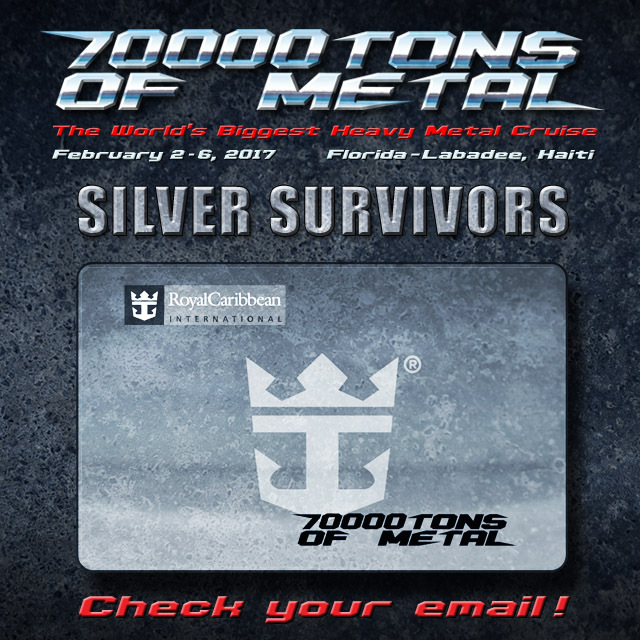 Booking for SILVER Survivors (1 or 2 previous sailings) will start Thursday, July 14, 2016 at 3PM EDT (9PM CEST). GOLD Survivors, don’t miss out on your chance to book early! You can still use your SURVIVOR NUMBER for early booking until Public Sales start. If you are new to 70000TONS OF METAL, you need to wait for Public Sales. More info about this will be released SOON!